What’s the most recommendable small SUV for the most people? Once again, the answer is the Honda CR-V. In the five years the Kelley Blue Book Best Buy Awards have existed, Honda’s compact crossover has won its category four times. Given that the small SUV segment continues to grow in popularity with each, that’s no mean feat. Winning this category also means the Honda CR-V bettered some dozen competitors, including all-new versions of formidable challengers like the Subaru Forester and long-time archrival the Toyota RAV4. The Honda CR-V excelled in every category, from its class-above interior size and flexibility to its fuel efficiency and safety features. Throw in useful tech features and a sterling reputation for reliability and resale value, and the CR-V continues to pull ahead of the pack. Whether you’re looking for a safe, practical, easy-to-drive and easy-to-own car for a younger driver or a leather-laden mainstream SUV that could give some luxury vehicles a run for their money, there’s a CR-V to meet your needs. The CR-V itself was totally revamped just last year, and with the all-new model came a small but efficient turbocharged engine, Apple CarPlay/Android Auto smartphone compatibility, and the Honda Sensing system that bundles active safety and driver-assistance features like automatic emergency braking, blind-spot monitoring, lane-keeping assist and adaptive cruise control. Skip the base LX model and you’ll get all those features standard, plus unexpected creature comforts like 12-way power operated and heated driver seat. Practical by birth, one of the CR-V’s best traits is just how much room there is in its otherwise compact footprint. Presenting 75.8 cubic feet of usable space with the rear seats folded flat, the CR-V’s cargo space remains near the top of its class. That figure even edges the larger, all-new 2019 Hyundai Santa Fe, itself a highly recommendable crossover SUV with a larger footprint that is good for growing families. Also impressive: the MPG the 2019 Honda CR-V returns. The older, 2.4-liter engine used only in the base LX model still gets up to 34 mpg on the highway. The new, smaller, and more powerful 1.5-liter turbocharged 4-cylinder that is used (and recommended) in the rest of the lineup is only a tick behind, boasting up to 33 mpg. Whichever powerplant or trim you choose, you can get all-wheel drive for added traction and more confidence on slippery, weather-fouled roads. No writeup about a Honda would be complete without mentioning the brand’s strong reliability and resale value. These two characteristics are especially noteworthy in the CR-V. Its reliability has been enviable over its 20-plus year existence, and it’s a mainstay among Kelley Blue Book Best Resale Value Award winners. There are now more than a dozen small crossover SUVs competing for space in your garage. 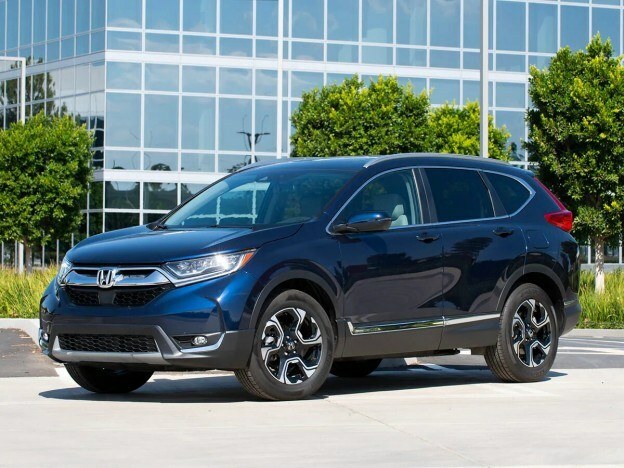 Almost all have at least one standout trait, but none are more well-rounded or more recommendable than the 2019 Honda CR-V. Build and price your own 2019 Honda CR-V to see this week’s Fair Purchase Price, 5-Year Cost to Own and more, or check out the CR-V models for sale today at dealers near you. This entry was posted in Awards & Accolades, CRV Articles on March 21, 2019 by Administrator. ← The Honda Accord has appeared on our 10Best Cars list a record 33 times.